Kapampangan shoppers will be #WOWEDatSMAppliance for its new look, which is now showcased at the newly designed SM Appliance Center at SM City Pampanga. The new look is a dynamic way of highlighting the most innovative products to help each Filipino transition into a digital home. 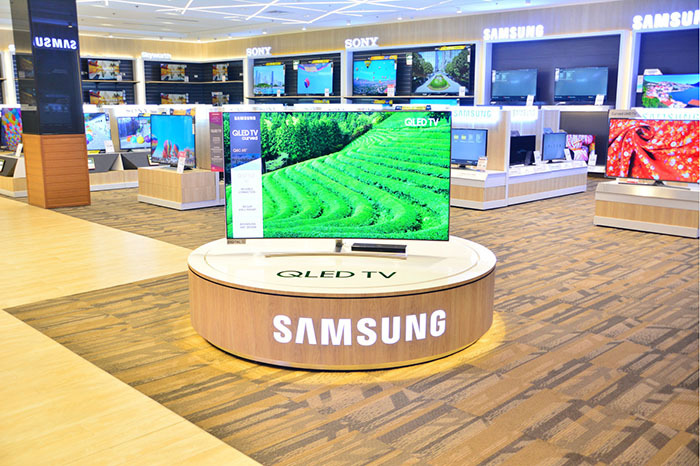 The newly designed SM Appliance Center at SM City Pampanga offers a new dynamic way of showcasing the most innovative products to help each Filipino transition into a digital home. 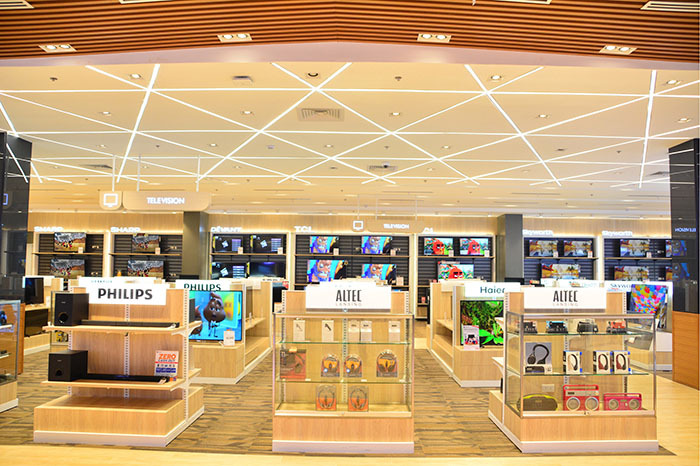 The 2,300 square- meter store located at the ground floor of SM City Pampanga, in fact, welcomes customers with two entrances, creating a store environment with attractive focal points that ease navigation and encourage discovery along the shopper journey. 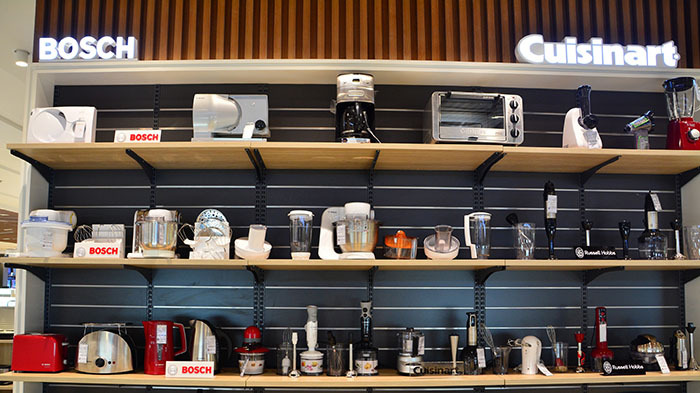 The Small Kitchen Appliance Section. 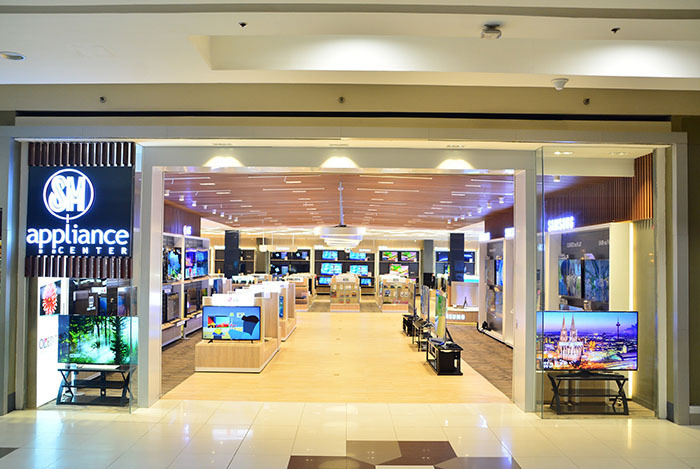 That SM Appliance Center’s new look should debut at SM City Pampanga highlights the special relationship between Kapampangan shoppers and the store. 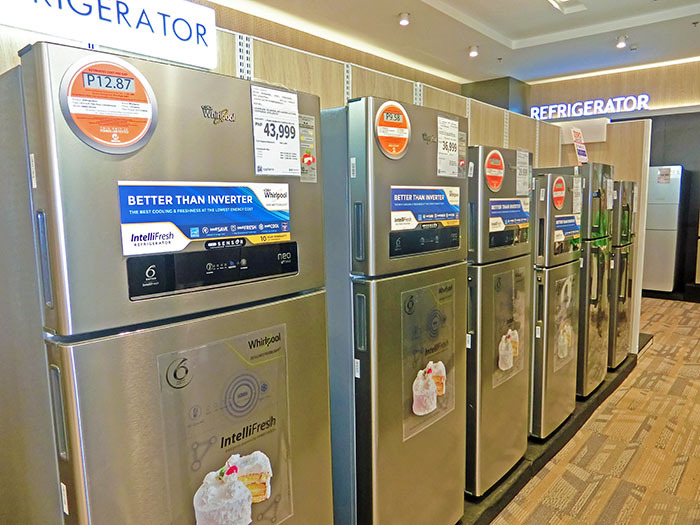 In fact, it has selected appliances that will be first available in Pampanga for the launch, giving local shoppers first dibs at these exciting items. 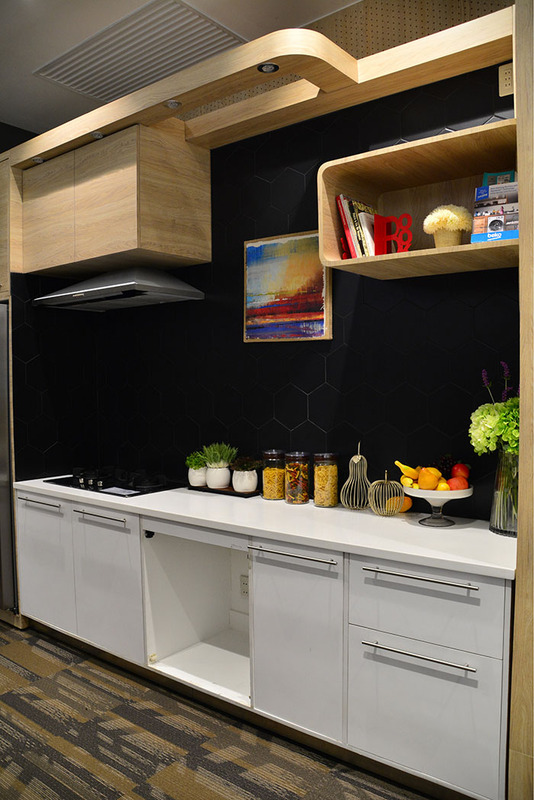 Lifestyle showcases give customers great ideas and help to conceptualize their kitchen. Wood + Greens = A Modern Yet Homey Ambiance. 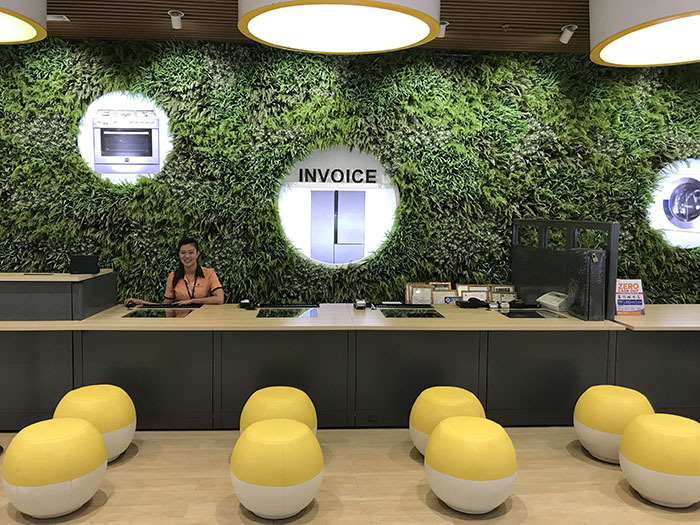 In a departure from the usual industrial feel associated with appliance stores, the new SM Appliance Center’s use of warm timber slatted finishes in its sloping ceiling at the entrance creates a warm and inviting feeling, much like that of arriving home. Foodies build their dream kitchen with the refrigerator, gas ranges, built-in ovens, chimneys and range hoods in the kitchen showcase areas. The slatted timber ceiling and suspended pendant lights work to guide shoppers into the main display areas. The point of sale counters, on the other hand, provide a warm and natural environment with integrated greenery to further emphasize the familiarity of the home. Focal display like this Samsung module, draw customers to key areas in the store. An Easy and Exciting Customer Journey. The main display area, with a striking and illuminated geometric ceiling draws the shoppers into the main display area. Here, the custom designed displays and consistent stylish illuminated signage make it easy for customers to navigate and find the product they are looking for. The main display area, with a striking illuminated and geometric ceiling. The custom designed displays and consistent stylish illuminated signage make it easy for customers to navigate and find the product they are looking for. The Best and Most Trusted Brands Plus Great Service. In the store, customers can find the best and most trusted brands in the industry as well as the latest and greatest gadgets and appliances fresh from the manufacturers. SM Appliance Center has long been known not only for great value, but also for its great service. The store’s entrances are characterized by the use of warm timber slatted finishes, with a sloping ceiling to create a warm and inviting feeling, that of arriving at home. Innovative Showcases. 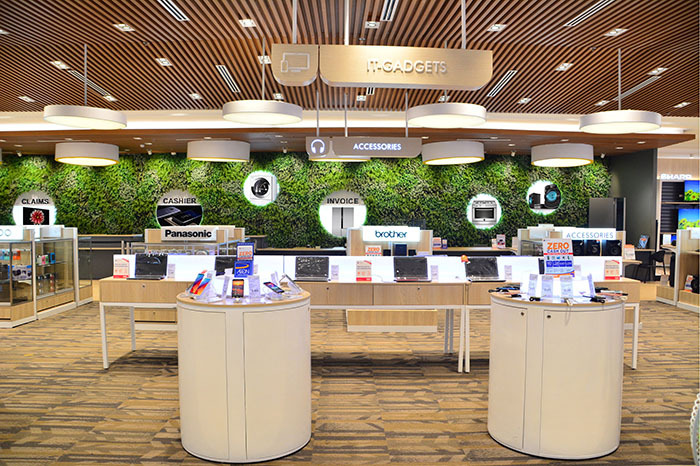 The unique circular display units with cell phones and small devices are a welcoming break along the customer journey, offering discovery and access to the latest gadgets and devices. Integrated greenery provides a warm and natural environment at the point of sale counters, further emphasizing the familiarity of the home in the store. Lifestyle Kitchen Counters. Filipinos are known to be foodies, especially in Pampanga, the Culinary Capital of the Philippines. 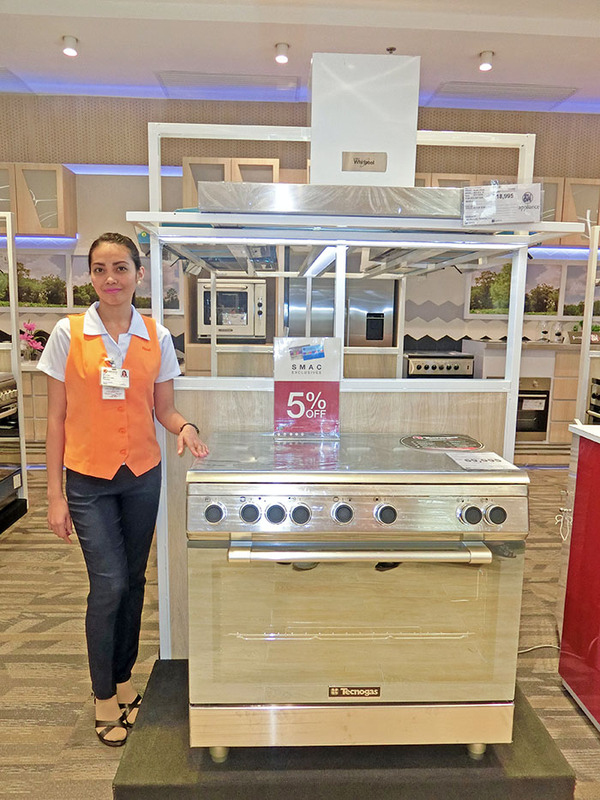 The new look of the store features lifestyle kitchen counter set-ups with refrigerators, ovens, cooking ranges and chimney and range hoods – giving shoppers ideas on how these will look in their homes, and how they can build their dream kitchens. 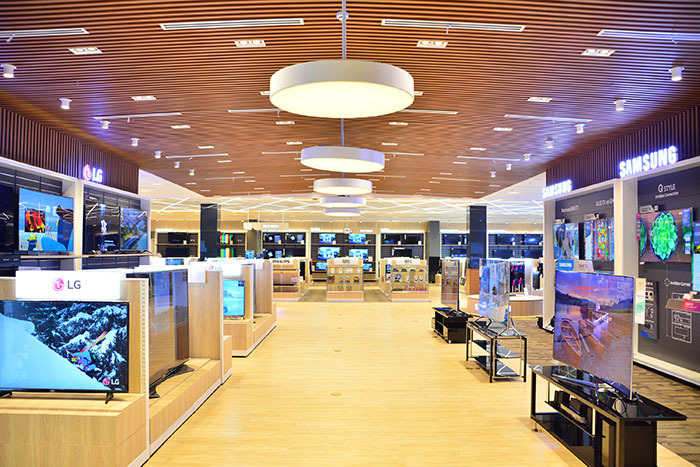 Unique circular display units with cell phones and small devices are a welcoming break along the customer journey at the store offering discovery and access to the latest devices. A Cool, Colorful Mini Lounge. Shoppers can take a short break at the store’s mini-lounge with a vibrant yellow finish that creates a high contrast from the appliances. 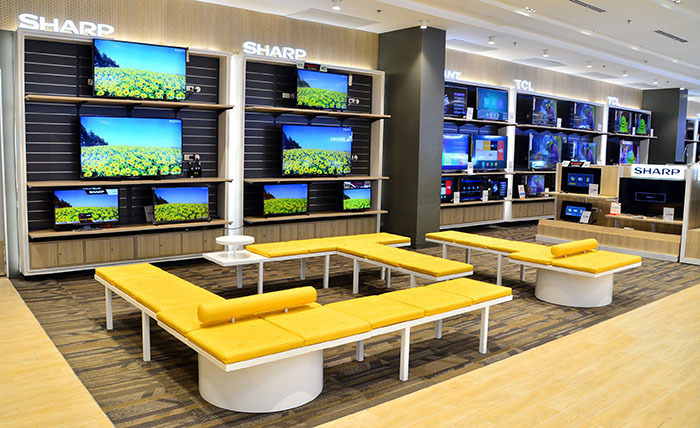 Comfortable spaces in between merchandise like this vibrant yellow themed lounge area at the television section makes the store not only customer but family friendly. Amazing Appliances First Found in Pampanga. SM Appliance has selected special products that will be available first in Pampanga for the launch. These include a new side-by-side Samsung Ref in gold tone and a Samsung 82 inch 4K Ultra HD TV. AN SM APPLIANCE PAMPANGA EXCLUSIVE: Brikk retro solo 4.6 cubic ft. fridge with freezer compartment that comes in cream, light blue and red colors and a Brikk retro microwave oven with an electroplated handle and a turntable glass tray. It comes in cream, blue and green colors. Brikk retro tall 11.6 cubic ft. fridge with freezer compartment, exclusively available at SM Appliance Pampanga. Available in cream and red colors. Brikk – Exclusive for Kapampangans. 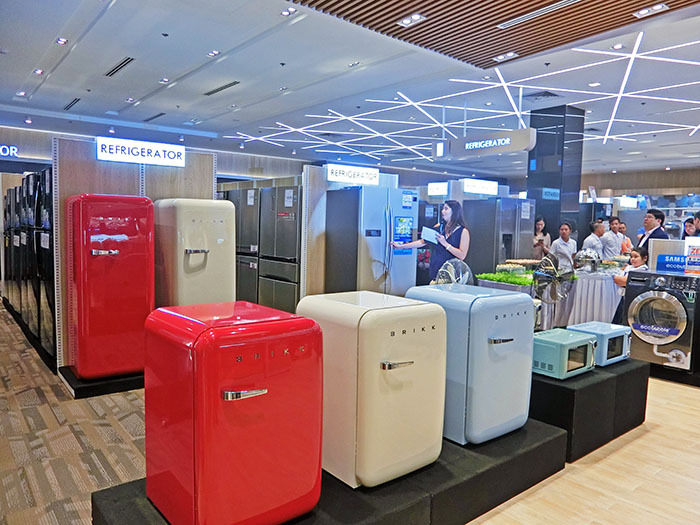 The newly designed store will also feature a showcase of the brand Brikk, which carries retro designed refrigerators and microwave ovens, exclusive to SM Appliance Pampanga. Be #WOWEDatSMAppliance. 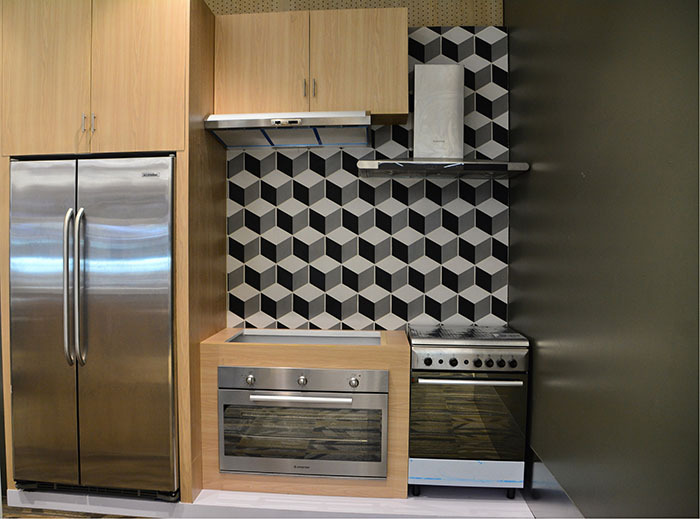 Visit the newly designed SM Appliance Center located at the Ground Floor of SM City Pampanga.